I love quiches so much because you can eat them any time of the day. Breakfast is the obvious choice, with brunch being a close second, but with a great arugula salad, dinner is served! There are a ton of different quiches out there to make, which makes it a versatile food as well. Since I have already done an egg white quiche, which is a great way to use up extra egg whites, it was time to do another quiche. 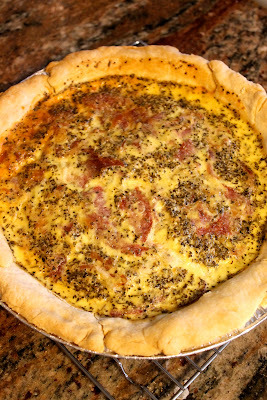 I wanted this one to be heavy on the Italian meats for a nice, meaty Italian-y quiche that will really get your morning (or evening) started right. A good line up of ingredients. Notice I use almond milk instead of cow's milk. I don't like cow's milk... can't help it. But you can use milk if you like, I won't judge. First things first: make your crust. I have talked and talk about how much I loooooove Jiffy Crust. It's cheap, it's easy and it sure does the job right! Now, you can also buy store made crust, it's just as good and yumtastic; it's just that I use too much crust to be buying up that freezer crust! Now let's make a filling for it! The eggs look like a flower like this, don't they?! Prettttty! I used 7 extra large eggs. You can use 8 eggs if you have smaller sized eggs. Mix it up with a fork! 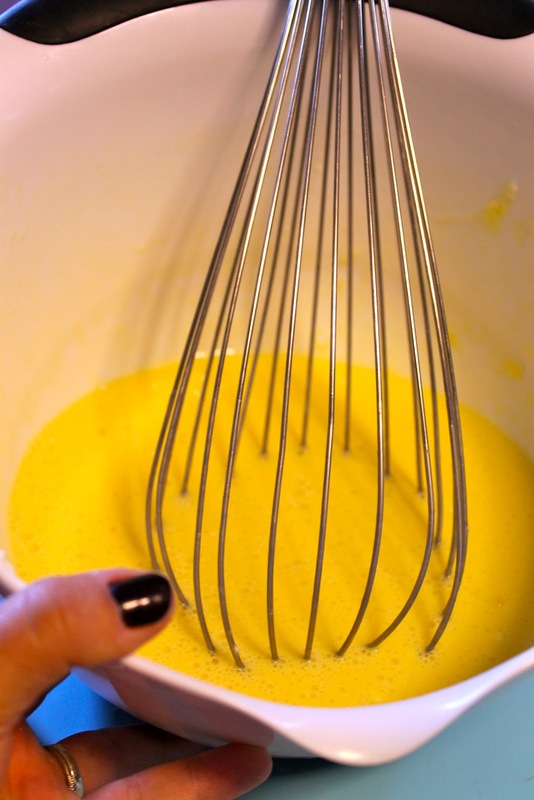 And break out your big whisk! Whisk it all together until the yogurt is incorporated fully. Mince in your two cloves are garlic. I used a blend of provolone and mozzarella, but you could use any variety of Italian cheese that you like. First the prosciutto--which is one of my favorite Italian meats. I just love the way it tastes and its versatility in so many dishes! Notice I am just shredding the meats with my hands into bite-sized pieces. Adjust slightly so that your meat is distributed as evenly as possible. 45 (ish) minutes later: perfection! 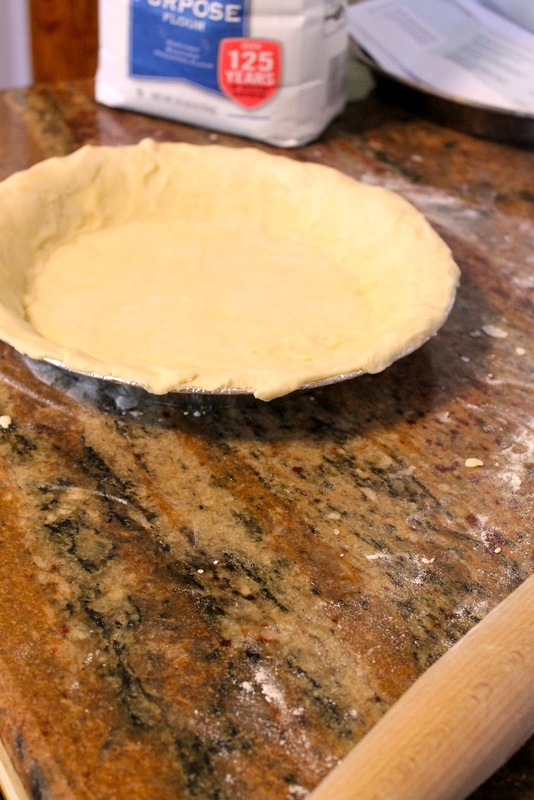 If using Jiffy Crust, prepare according to package directions and place in your pie tin. If you're using a prepared crust, you are already ahead of the game on this step! Add to your egg mixture your minced garlic, herbs, salt and pepper. Add cheese. 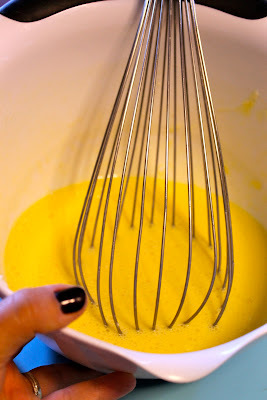 Using your hands, shred your meats into bite sized pieces and add to the egg mixture. Stir it allllll up so it's combined. Pour your mixture into your pie shell and using a fork, make sure that the meats are distributed evenly in the pie. Cook in the preheated oven about 45 minutes or until the egg is cooked and the crust is golden.